We’re breaking a soleful rule this summer, one step at a time. For both sexes, our obsession with sneakers this year has our comfy lace-ups being accepted in more places than a Discover card. Style Tip: For cocktail hour: men can pair a leather detailed or printed sneakers with tailored trousers and a button down shirt. For the ladies, put on designer pair of sneakers with a maxi dress or skirt or a body-con piece. Just make sure the sneakers are neatly laced-up like neckties for your feet. During the hotter months, both sexes can keep it short and cool with our bottoms. We gals have been wearing our shorts above, below and falling exactly on the knees for decades, now our fellow gents are embracing the stylish shorter options and showing off more of their well-shaped, tattooed or hairy legs. Men and women, this year let’s white it up together. 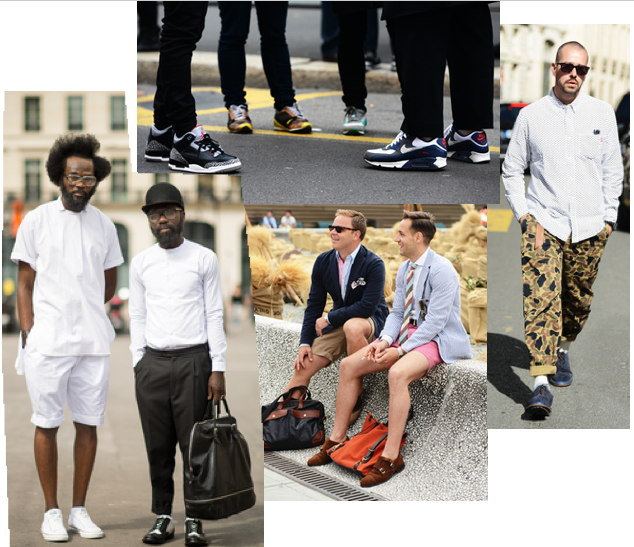 The men have embraced the all-white trend we ladies have been donning for some time now. White tees go without saying as summer staples, but rolled up white pants paired with a short sleeve button down shirt should no longer just be associated with the angelic beings in the room. 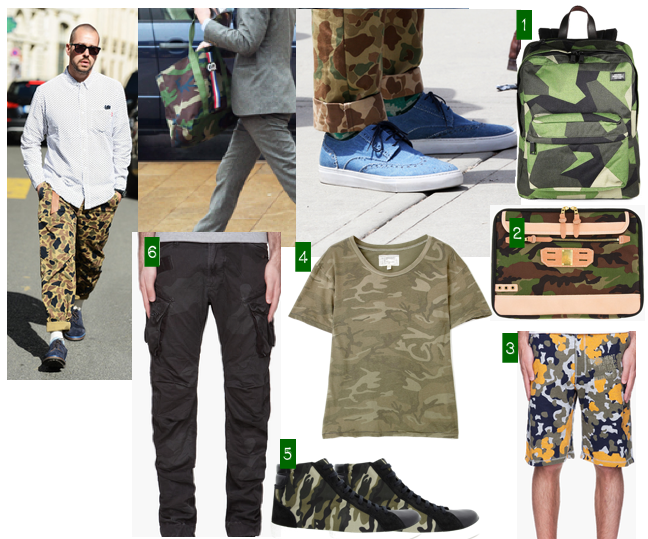 Camouflage is sticking around during the hot months and why shouldn’t it? The pattern meant for concealment or blending in does nothing of the sorts when incorporated with other fashion details in our backpacks, sneakers, neckties, outerwear, and clothes.